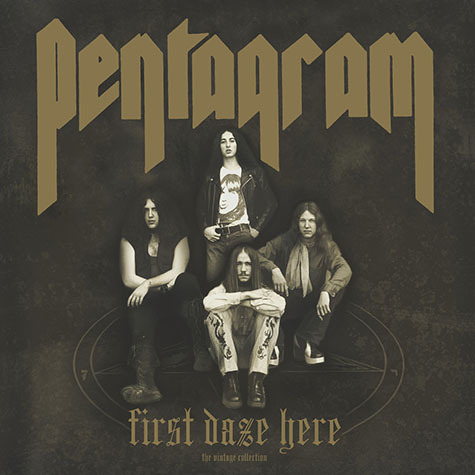 Pentagram reissues. Not much to say about this except, "Just take my money, Relapse Records." Check out the remastered "Forever My Queen" below. Info and links come courtesy of Relapse Records. Both reissues have been newly remastered and include in-depth liner notes from founding PENTAGRAM member / original drummer Geof O'Keefe along with gorgeously revitalized layouts. CD Version of First Daze Here includes a vinyl-shaped CD featuring the two newly remastered versions of the infamous Macabre 45! The original mix of the long-lost 45 will also see its first-ever vinyl pressing for this reissue, and is available in the deluxe First Daze Here / First Daze Here Too bundle or along with the Bone White / Gold Merge LP of First Daze Here. Stream the remastered version of the classic track "Forever My Queen" now at this location. First Daze Here and First Daze Here Too will both be released this June 17 on 2CD/LP/Digital and 2CD/2xLP/Digital respectively. Physical pre-orders, including a variety of limited-edition vinyl colors and exclusive package options containing the Macabre 7", can be found via Relapse.com at this location. Digital pre-orders for First Daze Here and First Daze Here Too are available via Pentagram's Bandcamp page here and here respectively.